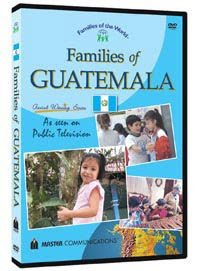 We recently discovered Master Communication's Families of the World DVD series, thanks to a recommendation from Natalie over at Mouse Grows, Mouse Learns. I understand it's a series aired on many public broadcasting stations, and you can find sample clips on YouTube. We were fortunate enough to find most of the series available through our local library. So far, we've watched about a dozen of them, visiting countries like France, Japan, Canada (for a comparison study, since we're familiar with that country), Costa Rica, Vietnam, and Israel, to name a few. Each program is about a half an hour long, and follows two children, one from the city, and one from the country, through a normal day, from waking up, to going to bed. The children range in age from about 5 to 11, so my own children, who range in age from 4 to 13, have found them interesting. Each program is crammed with material for further study, just touching on many things as the children pass by them, in their normal day. There is a real emphasis on the importance of education, and family life. And somehow, even though the countries we've visited so far, vary widely on the world economic scale, class differences are not highlighted at all. This is life as seen through a child's eyes, and it focus on the positive. I didn't think to check, until I was preparing to write this, but there are free teacher's guides, student handouts, and quizzes, including some companion activities, and recipes, on the Master Communication's website. Click here, to go there. Or, click over to the Geography and History link-up, at Children Grow, Children Explore, Children Learn, for more fun with history, or geography. I have to see if our library carries this series. They sound great. I am glad that you are enjoying the series. Thanks for the link that you shared - it will come in handy when we will restart our country studies in January. Christy - Yes, thanks for catching that! This DVD series sounds great. I wonder if our library has these.Thank you for sharing. Ooohhhh, I need to remember this when we go back to study countries. I am going to keep this series in mind when we get ready to move on from the U.S. Thank you for all the information and the link for other activities. When I was in Korea, they had public channels on TV where they covered the social, cultural, economics, political, daily lives of people in various countries. It's too bad this is not the norm in the US. I will have to try looking for the dvd's. Thanks!